For easy feeling silky and smooth, beautiful feet. The surface of the velvet smooth (TM) treatment roll is with long lasting Mikroabrasiven particles and precision ground Diamond Crystals. It removes the roughest skin from the first application and leaves visibly smoother and softer feet. Ergonomically shaped soft touch handle, Interchangeable treatment rollers with diamond crystals, gentle and effective circular motions, Battery Operated, ready to use. 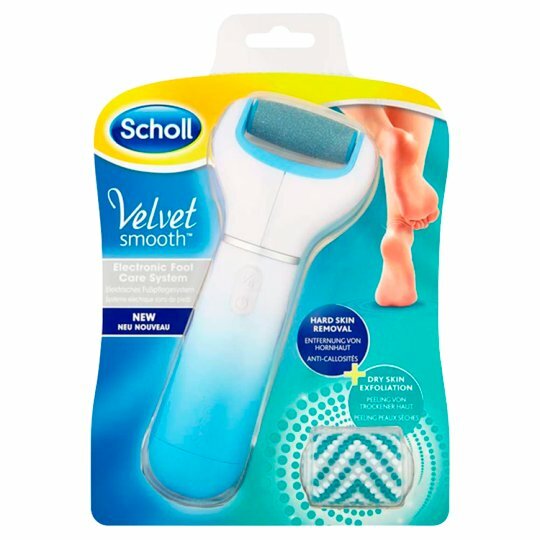 Use the brush to gently exfoliate dry, flaky skin on your feet and lower legs. Helps your moisturiser to keep your skin smooth and soft. Regular Coarse roller head removes hard skin that builds up under pressure. Instructions for use: Retain the outer packaging for future reference. See inside for full instructions. Precautions: Regular Coarse roller head. For use on hard skin of the feet only. 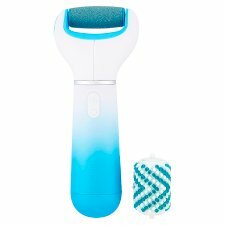 Dry skin exfoliation brush: For use on the feet and legs. Do not use the device anywhere on the body. Only use for its intended purpose. Keep out of reach of children. Do not use in the same area for more than 3-4 seconds at a time. Stop use immediately if irritation or discomfort occurs. Do not use on broken, sore or irritated skin. Do not submerge the device in water. This product is not suitable for diabetics and those with poor blood circulation. Do not use exfoliation brush if you suffer from a dermatological condition. Keep long hair away from the device when in use.